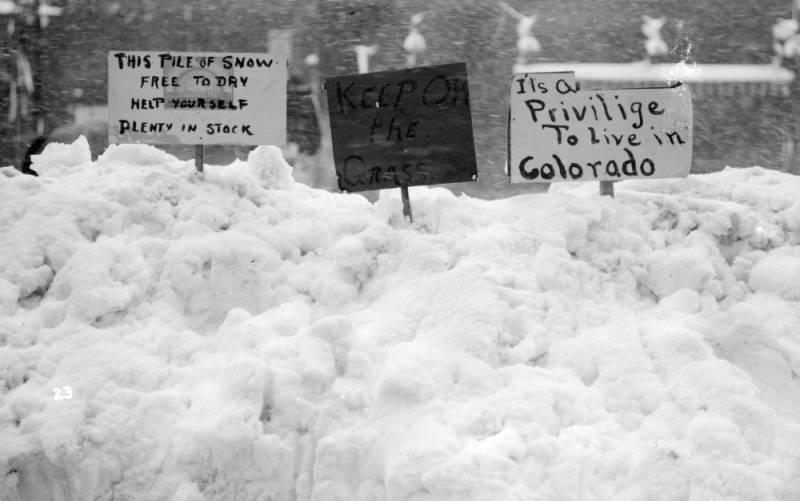 Denver's Biggest Blizzards: Be Glad You Didn't Live in 1913. Blizzard rush hour, 1913. Courtesy of Denver Public Library. Denver has had some roof-crushing, soul-freezing storms that shut it all down. While the mountains are looking good for snowpack this season, Denver's winter has been fairly, well ... unspectacular when it comes to accumulation of the white stuff. We've had some traffic-stopping, blizzard-like storms here and there that have wreaked havoc on the roadways, but overall, it's been pretty mild. That's not always the case. Snow clouds over Denver can really dump when they put their mind to it! 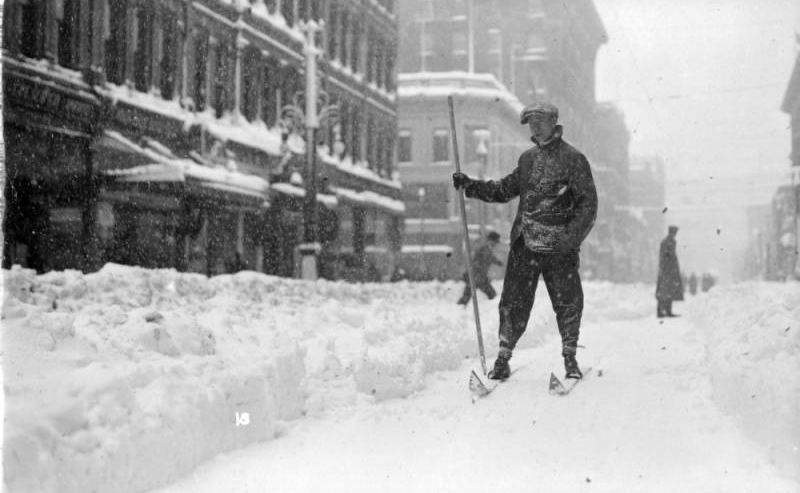 Let's take a look at the five biggest recorded blizzards the city has dug out from (from the 1880s to the present). Free snow! 1913. Courtesy of History Colorado. The year was 1913 and Denver was a December ghost town of white. This biggest snowstorm in the city's history dumped a whopping 45 inches of snow in just a few days -- and most of the residents weren't prepared (not that our modern-day meteorologists help us out that much). To give you perspective, the 2017-2018 season only saw 25.7 inches the whole winter. The Denver Post's headlines read, "No trains… No Schools… No Taxis, No Mails, No Noises, No Deliveries, No Funerals, Nothing But Snow, Snow, Snow and Still Falling…” This storm system dumped up to 60" of snow in the mountain communities, leaving behind a heck of a mess to deal with when it came to snow removal, which was mostly done by horse and wagon. In Denver, the snow was hauled to what is now Civic Center Park during the process. Check out some of the cool photos of the aftermath from the Denver Public Library. 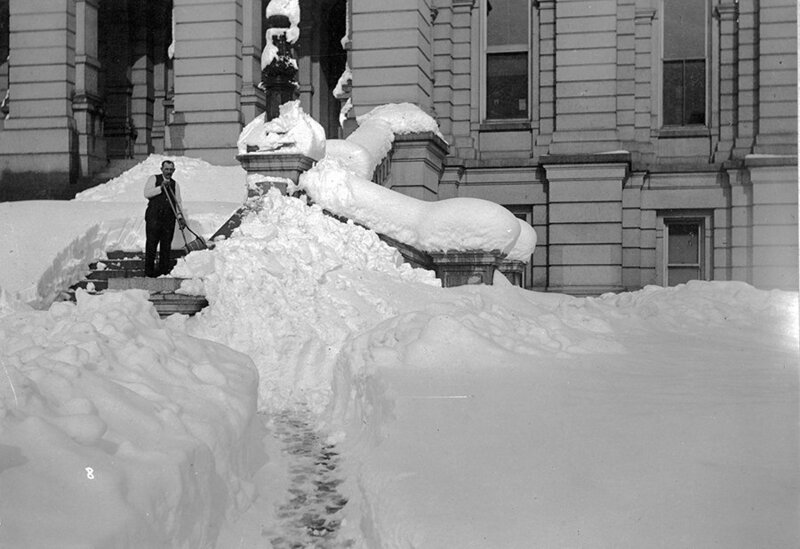 Clearing the State Capitol after the 1913 Blizzard. Courtesy of History Colorado. Where were you on St. Patrick's Day 2003? Probably buried in a snow drift. This spring storm hit Denver with a total of 31.8 inches in the space of a couple of days. That caused over $34 million in damage, according to insurance claims of the time. Winds accompanied the precipitation, causing drifts as tall as six feet. The foothills saw even worse conditions (some claim they received up to 82 inches of the white stuff). And travel? Forgeddaboutit. DIA closed down, leaving thousands of travelers stranded. Digging out in 2003. Courtesy of AP File Photo. Picture it: Denver, 1946. Snow piled up in the city to the tune of 30.4 inches. 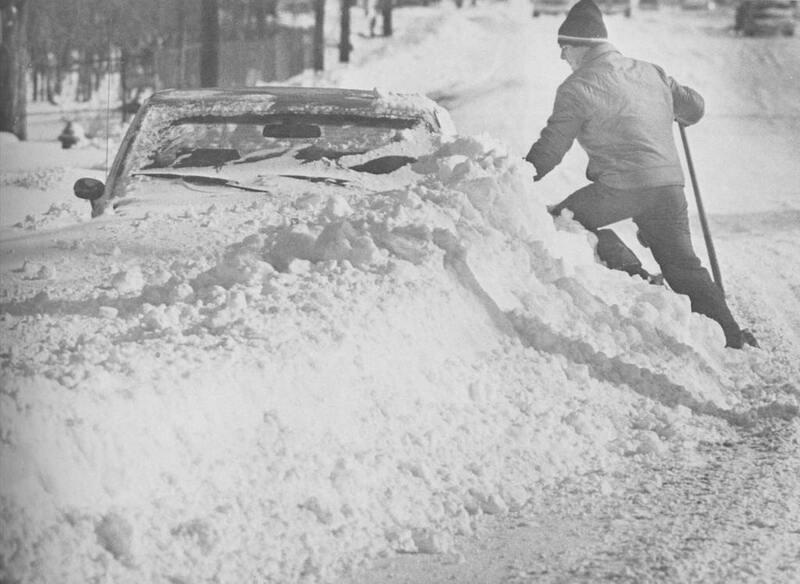 This was the second-longest snowfall recorded in the city's history, lasting 70 hours and 46 minutes. The Eastern Plains also got the brunt of the storm with many locations reporting over three feet of snow on the ground. 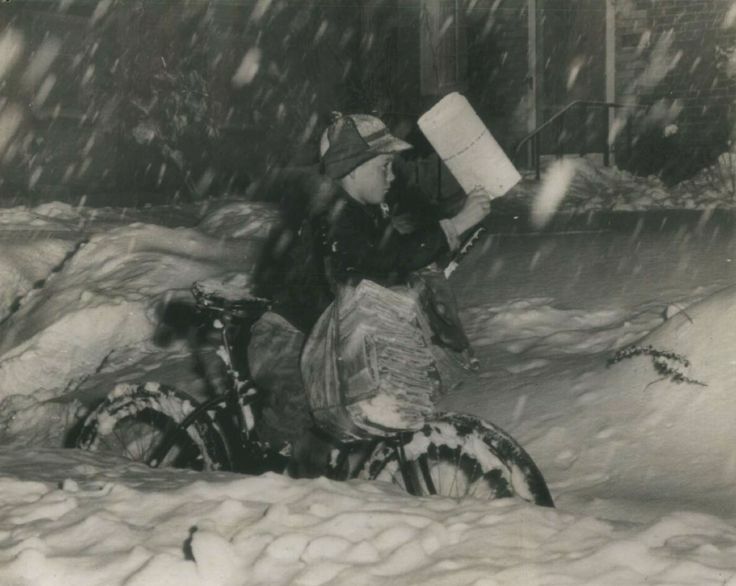 "I used to deliver papers 10 miles in the snow, uphill both ways." 1946 storm. Courtesy of AP File Photo. Like Santa on his sleigh, the storm flew through the holiday night sky and dumped a present on everyone: a blizzard. From Christmas Eve through the following day, the storm produced 24 inches of snow. High winds caused huge drifts to cover cars, streets, and more. Holiday plans throughout the city were on hold, though it wasn't uncommon to see people hitting the streets on skis and snowshoes. Freaking snow plows. Courtesy of Denver Public Library. Not to be left out of the big leagues, the 1800s are coming in hot, or cold, rather, with a 23-inch snowstorm recorded in one spring day. To give you perspective on when this happened, the Statue of Liberty was a year away from installation in New York. Not much is known about how people managed, but I imagine trying to get to the outhouse was quite the adventure. Were you in Denver for any of the recent blizzards? What did you think of the snow? Let us know in the comments below. 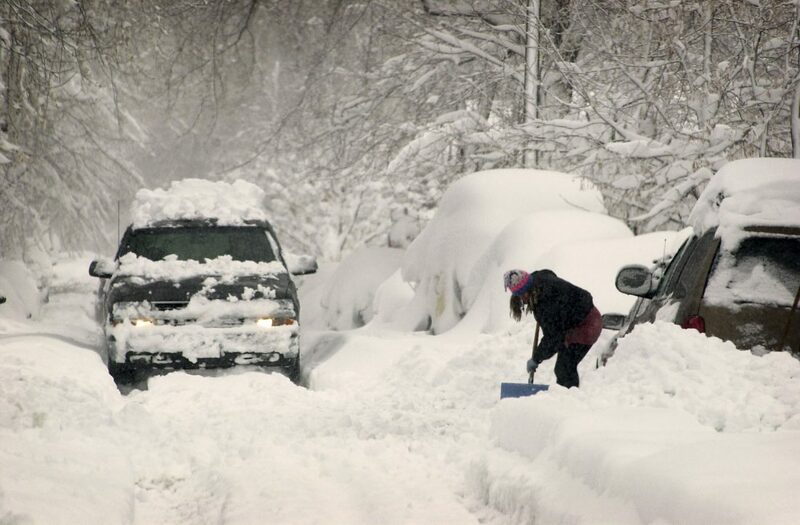 Do you know what to do if your car gets stuck in the snow?